“So Jacob swore by the Fear of his father Isaac, and Jacob offered a sacrifice in the hill country and called his kinsmen to eat bread. They ate bread and spent the night in the hill country” (Gen. 31:53b-54). Antagonism and deception defined the relationship between Jacob and Laban until their confrontation in Genesis 31. However, with Laban put in his place and a covenant initiated, Jacob and his father-in-law now stand as equals. The very fact that Laban proposes a covenant at all (v. 44) indicates that he now regards his son-in-law as a peer worthy of respect. No longer may he push Jacob around; now Laban must treat him as one with the same status he possesses. Laban’s pact with Jacob does not make them close friends. Laban is wary of his son-in-law, probably because he knew his own deceptive nature well and is projecting his own character onto Jacob. He establishes the pillar and heap as a boundary, marking off the respective territories of the two men (vv. 51–52). Yet this is not necessary, because Jacob is intent on returning to the land of his fathers and will not be coming back to Paddan-aram (vv. 3, 21). But Laban wants to be sure he will not have to deal with Jacob again. Still, though they are not friends, their separation is an amiable one, unlike the circumstances surrounding Jacob’s flight from Esau. This is clear in the covenant meal following the oath-swearing (v. 54). Such suppers show that the parties to the covenant are at peace with one another. As in every covenant ceremony, vows are sworn, but there is a marked difference between the oath of Laban and the oath of Jacob. Laban swears in the name of many gods, placing Yahweh alongside the gods of Nahor and others. He shows this to be the case by using a plural verb to describe these deities whereas Jacob consciously swears by only one God — “the Fear of his father Isaac” (v. 53). This name for the Lord is found in this chapter alone (see also v. 42) and is notable for two reasons. First, Laban is trying to shelter himself from Jacob’s Lord because he is afraid of the Almighty. 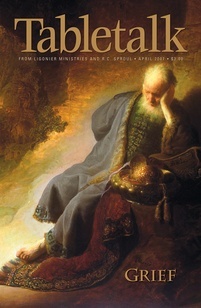 Therefore, Jacob wisely uses the title “Fear of his father Isaac” to keep Laban in his place. More importantly, fear for God, in the form of reverent awe, is the attitude Scripture prescribes for us in life and worship (Deut. 10:12–13; 1 Peter 2:17). Jacob has learned more of this fear in Paddan-aram through the Lord’s use of Laban to discipline him.